What made you decide to change career direction from restaurateur to ceramic artist? It had always been in the back of my mind to pursue my artistic inclinations, and when making celebration cakes for customers in my restaurant, modelling marzipan reminded me how much I enjoyed clay. 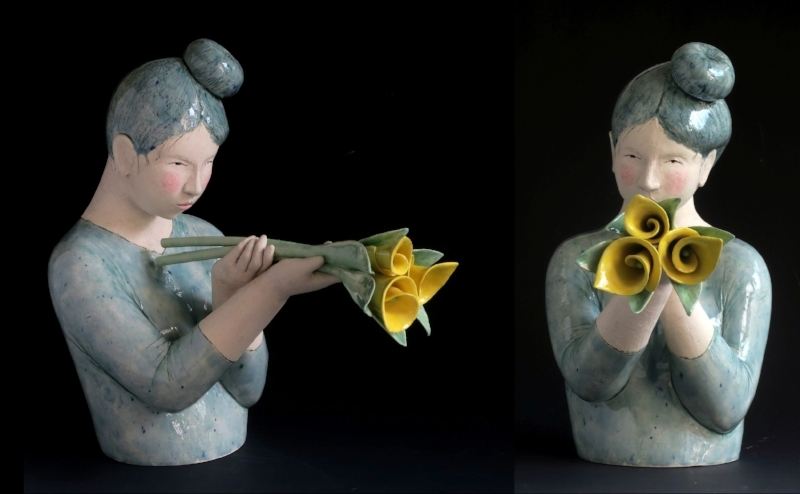 Why did you choose ceramics as your art form? I have worked with all kinds of media but somehow found I came back to clay, and as my skills grew the ideas and the use of the medium started to develop alongside each other. Tell us how the national touring show of humorous ceramics with Johnny Vegas came about? It’s a long time ago now but I think there was a request for entries in Ceramic Review or some such publication. I never expected to be selected. Describe the first things you do when you get into your studio? Put on some music or the radio – I might not even be really listening but it helps me to block out the world. I will look at the previous day’s work and hope to see it afresh – whether it’s going ok, needs changing or rethinking. It can actually be months or years before I can see a piece of work clearly and know if I’m happy with it or not – by which time it’s too late! Likewise, it can take a while before I really understand or can articulate what the idea behind a piece is about. Humour is central to the pieces you create and there always seem to be a narrative how do you come by your ideas for you next piece/s? Ideas come when you’re not looking for them. They can come in a flash and the hard work is finding a way to realise them. Ordinary life provides most material so I need to get out there to experience and observe it but then need the space to get inside my own head to think about things. One piece can lead to another as an idea develops, but not necessarily straight away (see answer above). What are your starting points for your pieces? Do you sketch or does your figures emerge from the clay? Some kind of sketch is nearly always necessary – sometimes to help pinpoint the idea sometimes for technical purposes or both. They don’t really emerge, I have to know roughly where I’m going. A full figure always starts from the feet. Your sculptures employ many techniques including pattern cutting. Have you an interest in textiles? Yes, I have an interest in textiles but actually have no tailoring or pattern cutting training or expertise. I love pattern and colour, which I can indulge in the glazing of my pieces. You are renowned for your series of works entitled ‘Small Visitors’, which explore the experience of real environments. Tell us why and how you came to produce these installations? I was involved with a group of ceramic artists who were invited to exhibit in a church, somewhat hidden away but in the centre of Leeds. The congregation was dwindling, the building crumbling and the walls & entrance a convenient urinal for those caught short. They were trying to become more visible to the public, thus the exhibition. Rather than just display existing work I thought it would be interesting to respond to the space. Many churches are losing their congregations but remain as architecturally interesting spaces so I made the little figures to encourage visitors to look more closely at the place. Your pieces are low fired, why have you chosen this firing temperature? Because the range of glazes and colours I’ve developed work at this temperature range. Your pieces are meticulously executed. How many pieces you can create in a year? Oh dear, truth be told, only about 20. Do you like working from your home studio? What has been your highlight of your career to date? Realising I’d found my own visual language for expressing ideas. What would you like to be remembered by? What a question. Er, bringing a little pleasure.